In Monday’s post I mentioned that I used a new (to me) technique on the hardware for the blue alligator dresser. 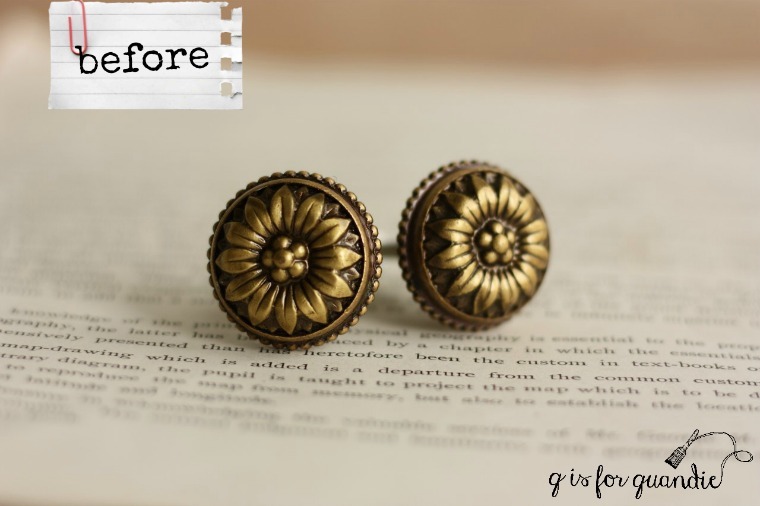 The original drawer pulls on the two bottom drawers of the dresser (which I kept) were a very well aged brass, but my 4 replacement knobs for the top drawers were a kind of tacky new ‘brassy’ color. 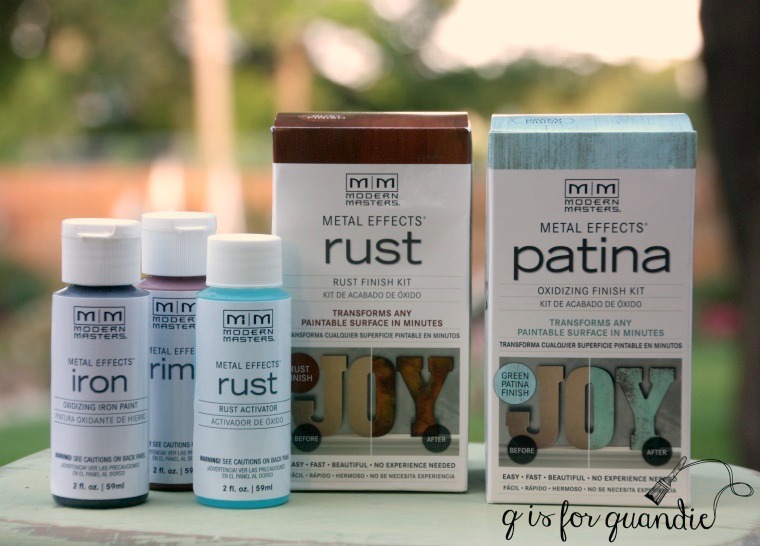 I realized this would be the perfect opportunity to pull out the Modern Masters Metal Effects patina kit that I purchased last year at Hobby Lobby and use it to unify my old and new hardware. The copper patina kit comes with a small jar of primer (which I ignored), a small jar of copper paint and the activator. 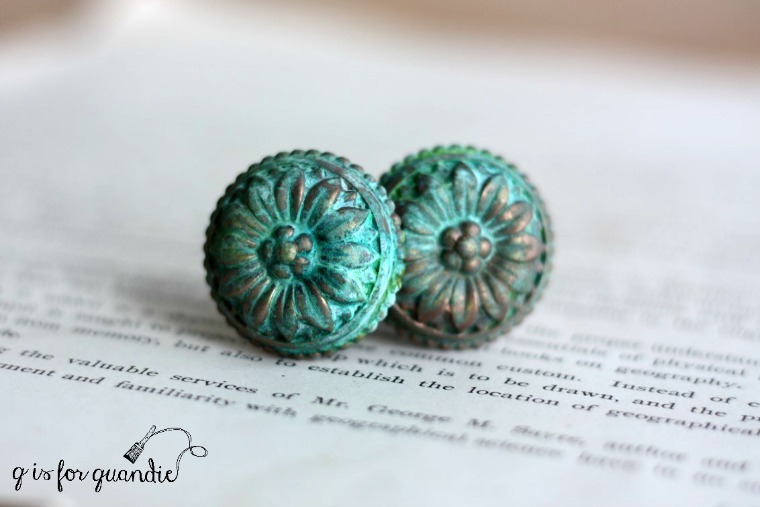 I started by painting my knobs and the original drawer pulls with the copper paint. Before the second coat of paint was dry, I sprayed on the “green patina aging solution” that came with the kit. As it dried, I could see the patina beginning to form. Which made these knobs just about perfect for the blue alligator dresser. They blend quite nicely with my custom Blue Alligator milk paint color, thus allowing that gorgeous transfer to be the star of the show. Applying Sealer Effect, a protective sealer and top coat is highly recommended over the Iron/Rust Finish. Particularly on interior surfaces where there may be contact or exterior surfaces to prevent runoff of the rust finish caused by rain or sprinklers onto surrounding areas. It is not necessary to seal/topcoat the Copper/Green Patina or Bronze/Blue Patina finishes, except if the patina surface is subject to repeated hand contact, such as hand rails. So … yes? no? maybe? Do any of you have experience with how these finishes hold up over time? If so, please share your knowledge in a comment! Next happy birthday to reclaiming beautiful. 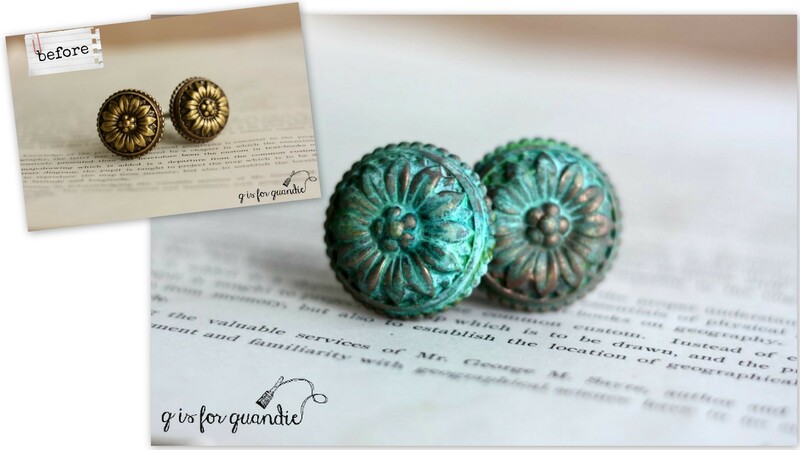 Love the green patina on these knobs! This little detail adds so much to the visual enjoyment of this piece. If they were left unsealed the finish may be worn off as the knob is used, which might look natural and desirable. I would be tempted to seal them as the change from wear and tear is not predictable. P.S. It irks me when I shop with my daughters and see painted pieces where the hardware has been painted right over with the same color as the dresser. Ugh! Rush job. 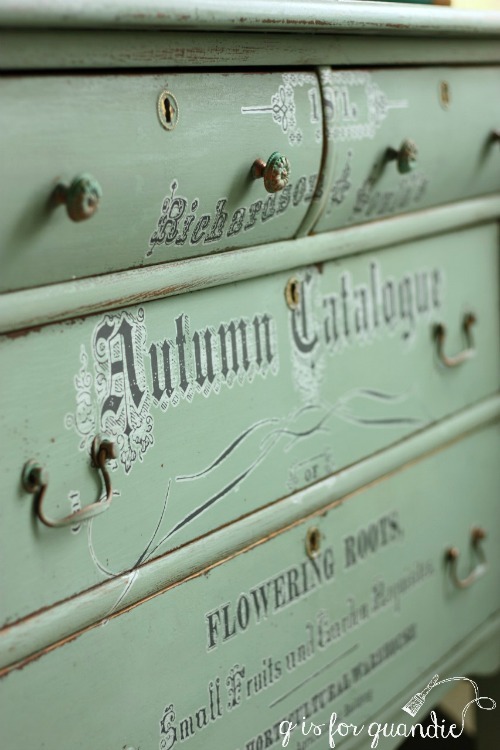 The green patina does blend in remarkably with the dresser but still creates a layer of detail that is satisfying to the eye. I was shopping with a friend a while back and we had a conversation about the painted over hardware that we were seeing, my friend was not a fan either. I have mixed feelings about it. If the hardware has been left in place and just painted over right along with everything else (the rush job that you mentioned), then I am definitely not a fan. However, sometimes I do like the look of hardware painted to match the rest of the piece. It can be a useful technique if you want the hardware to blend into the background. There is a positive aspect to old painted hardware. It is protected for the time you want to bring it back to its original glory. And, there is a process that does not involve caustic stripper for painted hardware. I am a fan of painted hardware. The Habersham Plantation furniture line uses this technique to add age to their pieces. However the hardware is removed before either the furniture or the hardware is painted. My husband uses Modern Masters quite a bit. I’ll get his opinion about sealing the hardware pretty sure he does. I love the combo nice job Linda. I would say seal them because they already look worn in and they will probably get handled a bunch. A clear acrylic spray sealer would be good. (MATTE, of course). If this product involves a chemical reaction and not just faux patina, then the sealer will fix it in place (depriving it of oxygen which is essential to the ongoing process) and, while keeping it from continuing the chemical reaction, it will also preserve the beauty you see now. Oddly, I read this post while in line at Hobby Lobby waiting to check out. You might also want to take a look at the new issue of Cloth, Paper, Scissors. 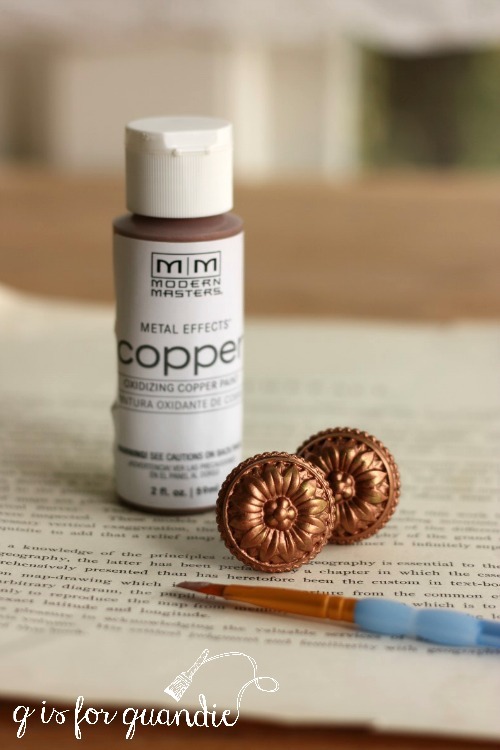 There is an article about getting some gorgeous copper patina finishes in just a few hours with household items. P.S. Happy Easter to all and to all a goodnight.